One of the significant drains on any mobile device, be it a smartphone, wearable or even your beefy laptop computer is undoubtedly the Wi-Fi radio component. Thus manufacturers more often than not quote 'Wi-Fi off' battery life among a newly launched device's key specifications. Now a team of computer scientists and electrical engineers at University of Washington have demonstrated the ability to generate Wi-Fi signals using 10,000x less power than industry standard devices use. In a blog post the Washington-based scientists introduce what they call Passive Wi-Fi. They say that they have achieved a first in generating 802.11b transmissions using backscatter communication. Furthermore the transmissions can be decoded on any Wi-Fi device including common-or-garden routers, mobile phones and tablets - a great asset with the ubiquity of Wi-Fi. Working on developments, applying their discovery, the team built a network with Passive Wi-Fi transmitters coexisting with other Wi-Fi devices. In tests the Passive Wi-Fi transmissions could be decoded by off-the-shelf smartphones and Wi-Fi chipsets over distances of 30 - 100 feet in various line-of-sight and through-the-wall scenarios. Speeds are admittedly impacted by the low power, with a Passive Wi-Fi IC putting out 1Mbps and 11Mbps transmissions (said to be 11x faster than Bluetooth) consuming 14.48µW and 49.28µW respectively. Connected systems designers may often prefer this extremely low power consumption and limited speed over faster speeds with significant power consumption. Being powered by backscatter has the potential to liberate a device from running connected to mains or some kind of gradually depleting battery, for example. The recent developments in this project, shown in the video above, should help facilitate a greater Internet of Things (IoT). Not that all of us want a greater IoT. Better mobile battery life sure. My toaster uploading its usage statistics? No thanks. 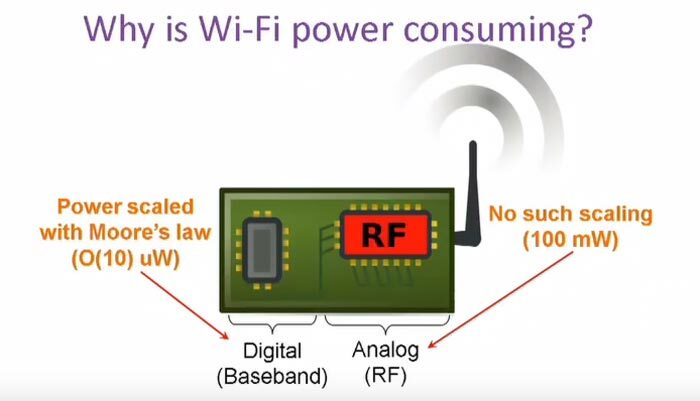 whats the battery life of the Passive Wi-Fi transmitters? Reading up on the technology it's not likely to do a huge amount for your mobile - at least not in the forseeable future - which is likely to still include active WiFi to ensure good connections at high speeds even when considerable distances from the transmitter/receiver bases. The whole area of Ambient Backscatter is very interesting - it's basically an extension/modification of the way RFID (which backscatters a dedicated RF transmitter) works, but using - unsurpringly - ambient RF signals like TV/Radio/Active WiFi to both generate power and transmit data (by reflection/modulation of the ambient signal). Well worth reading up on (IMNSHO ;) ). My vision of mobile application of this tech would be a seamless handover from the backscatter to active radio, allowing backscatter listen, then transfer to active when data is being transmitted or received. To optimize for this some qos shaping, and background service scheduling for delayed transmission could be used to ensure that once the active radio was fired up, a large burst of data could be transmitted before going quiet again.